The city may seem abandoned, but are the streets really empty? Who is Rhubarb? And why is he such a filthy squirrel? Will our heroes really find sanctuary on the roof-scape? your worlds are such fine places to go. They are gentle and just a little dark. I always enjoy the visit. another great piece!Love the perspective! Your perspective is so good it is making me dizzy!! The perspective is wonderful, and the lines are as always wonderful, but the story! Oh, I am so curious about the story. What is going to happen? What has happened? It feels like we are granted a peek into the middle of a very interesting and intriguing story, filled with surprises. the detail, the perspective the story, i'm hooked! 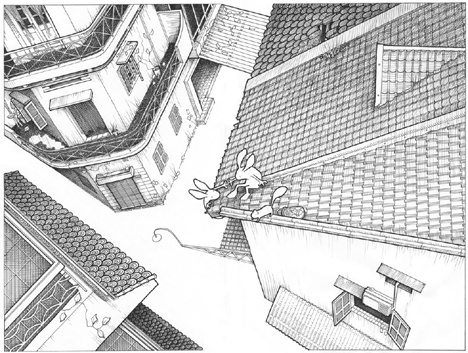 UUUaaauuuu Amazing composition, perspective and inking! admiring the perspective and details! ooh ooh wow! the detail and line work are amazing. such an incredibly-illustrated scene. and as always, love the animals! Super perspective and love that tiled roof! you have the patience of a saint to go into such detail! Oh, the questions, the DRAMA, the CLIFFHANGER (roofhanger?)! Great action and perspective here. I get such a sense of peril! your beautiful illo and great story have aroused my curiosity! i want to know what would happen to them finally! What a fantastic, very dramatic pov! What a nail biter! Brilliant!! This is great- the detail is just amazing!